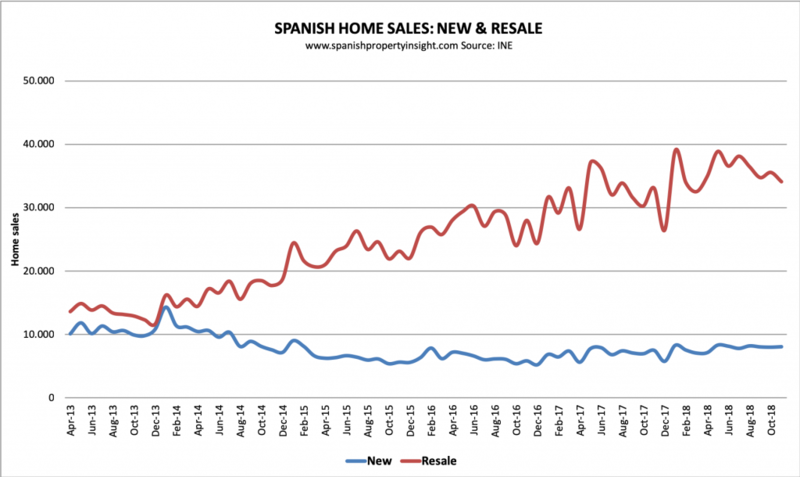 The number of Spanish home sales inscribed in the National Land Registry rose by 3% in November 2018 compared to the same month the previous year, show the latest figures from the National Institute of Statistics (INE), as illustrated by the chart above. 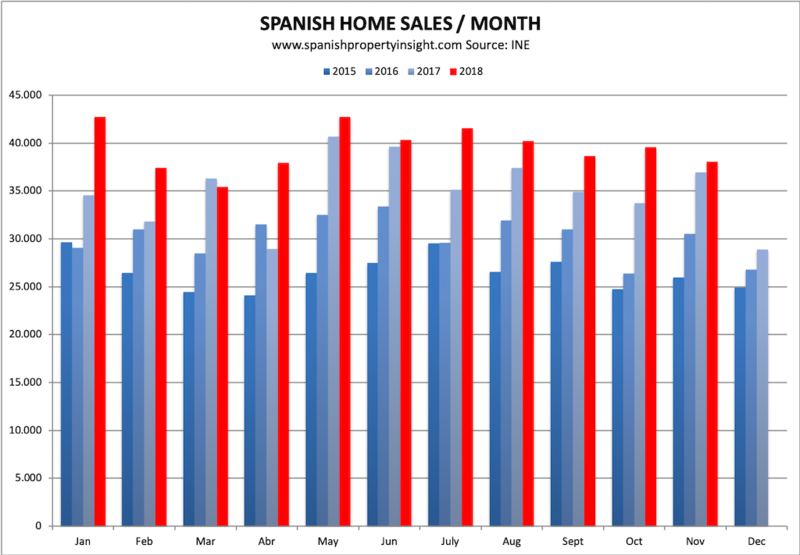 There were 38,084 Spanish home sales inscribed in the Land Register in November, and 42,150 if you include subsidised homes (known as VPO), all according to the latest figures from the INE, based on source data from the Spanish Land Registrars’ Association. 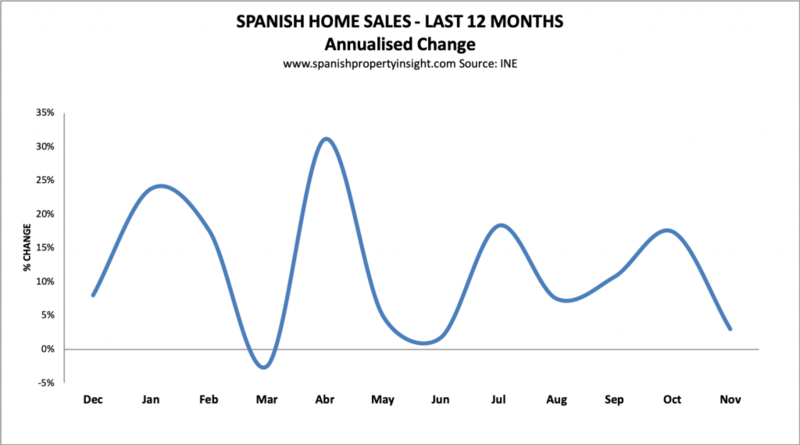 The Spanish property market has been growing since it started to recover in 2014, but the next two charts suggests that growth is starting to slow down, as one would expect it to one day. 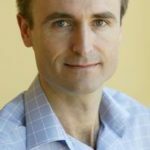 The average sales growth over the first 11 months of 2018 was 12%, compared to 16% in 2017. New home sales were up 8% to 8,043 and resales up 3% to 34,107, both in positive territory as they have been almost every month since August 2017. 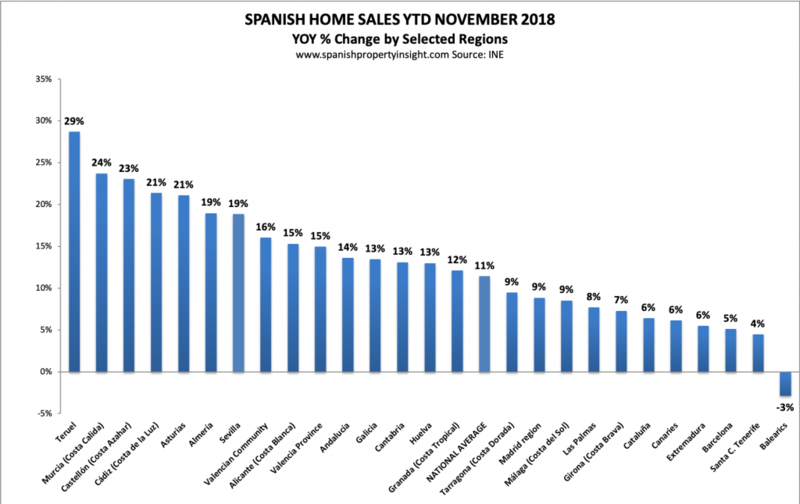 By region November was a mixed bag, with sales up strongly in small markets like Cantabria and Asturias in the north, and Teruel in Aragon. The province of Girona in Catalonia, home the the Costa Brava, also had a good month. In contrast the Andalusian province of Huelva, home to the Costa de la Luz, suffered a 54% decline in sales. Looking at how sales changed on a year-to-date basis (11 months) in regions that attract the most attention from foreign buyers, interest was up in all regions bar the Balearics, where sales fell 3%. 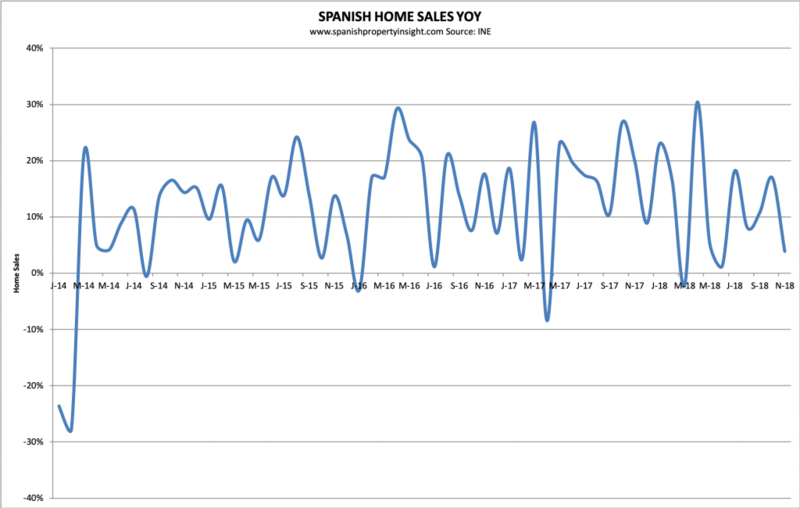 Growth in sales was also comparatively weak in Catalonia, possibly due to the political situation. Murcia deserves a mention in dispatches for it’s 24% growth. Despite it’s romantic name, rugged landscape, and sunny climate, Murcia is a bit of a backwater that is popular with British buyers, perhaps because of the marketing efforts of mega-developer Polaris World back in the boom years. Had it not been for Polaris World spending big on marketing in the UK before it succumbed to the Spanish property crash, Murcia might not be on the radar of British buyers as much as it is. A new airport in Murcia that has just become operational might boost foreign demand for the region over time.